It is true, we are stuck on beets and other Farmer's Market produce these days! Last night we enjoyed a meal focused on our recent purchases. The meal was simple, fresh and easy to prepare. 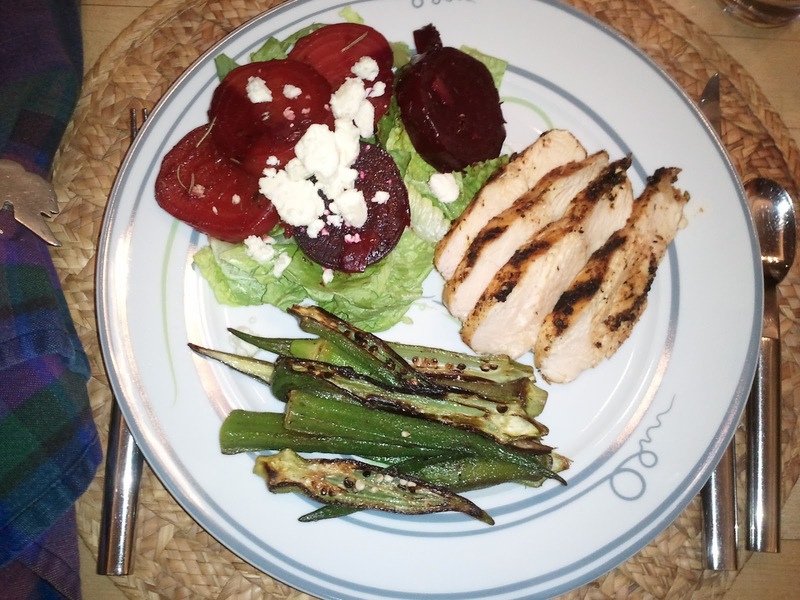 The menu consisted of a herb rubbed grilled chicken, a salad of roasted beets placed on a bed of lettuce and sauteed okra. The calories for the total meal was 347. The chicken was rubbed with Emeril's Chicken Rub (0 calories) and then grilled on our outside grill. Everybody got 4 ounces for 187 calories.. The beets were prepared according to our Roasted Beet recipe posted earlier this week (89 calories). I added a tablespoon of feta for 25 additional calories for a total 114 calories. The okra was done in a cast iron skillet with 1 teaspoon canola oil and a light sprinkle of salt and pepper for 46 calories. Cutting them length-wise and letting them brown a bit made them visually attractive and delicious to eat. It was a colorful meal. Fresh and healthy to eat. A fun way to celebrate the end of summer bounty. A definite repeat.